Unlike Honda with its Modulo accessories, Toyota of late had not introduced TRD Sportivo versions of their cars during launch, and some of its most popular models in Thailand are yet to receive the TRD Sportivo treatment. The new Camry was launched in October 2018 without one, but here it is – the Toyota Camry TRD Sportivo. The Camry TRD Sportivo builds on the already bold and sporty image of the latest Camry. The bodykit is fronted by a very prominent front bumper spoiler – the chin juts out significantly over the standard car’s. The lip portion is two-tone and there’s a TRD Sportivo emblem in the middle. There’s also a front grille garnish that can be had in silver or black – the red car here gets the latter. The sides and rear get side skirts and rear bumper extensions in a matching two-tone. The back end is further garnished with an elaborate trunk lid spoiler that resembles those used on hot hatches. The items are available a’la carte from Thai Toyota dealers in black, silver or unpainted. The red showcar here is a Camry TRD Sportivo wearing the full catalogue of optional accessories for the D-segment sedan. Some of it are pretty (18-inch two-tone rims), some are useful (dashcam, puddle lamps, kick-to-open boot function, air lumbar support), while others are garish (rear bumper upper protector, “kevlar” door handle protectors). The Camry is available in Thailand in 2.0G, 2.5G, 2.5 Hybrid and 2.5 Hybrid Premium variants, priced from 1.445 million baht (RM185,713) to 1.799 million baht (RM231,210). The base car is powered by a 2.0 litre naturally aspirated unit with 167 PS/199 Nm, paired with a six-speed automatic transmission. The 2.5L comes with a Dynamic Force engine with 209 PS/250 Nm, mated to an eight-speed auto. The Hybrid range topper combines a 2.5L petrol engine (178 PS/221 Nm) with a 120 PS/202 Nm electric motor for a total system output of 211 PS. In Malaysia, we have a sole 2.5V (184 PS, 235 Nm, 6AT) priced at RM190k. What do you think of the TRD Sportivo bodykit and accessories for the Beautiful Monster – suits the car or too much? 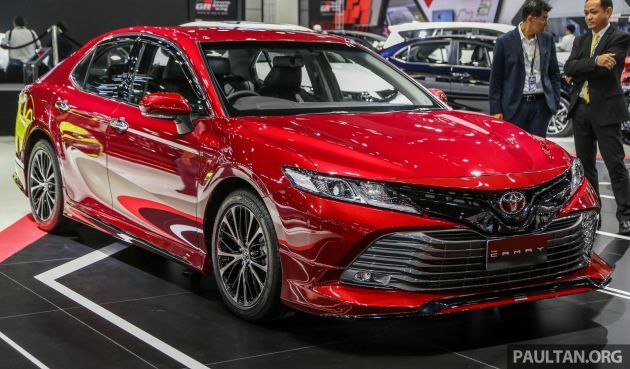 The post Bangkok 2019: Toyota Camry TRD Sportivo w bodykit appeared first on Paul Tan's Automotive News. 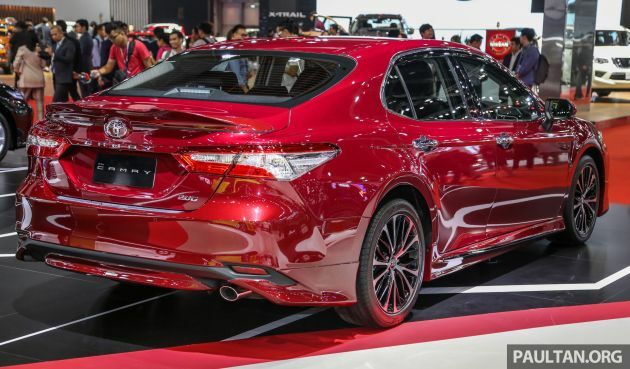 0 Response to "Bangkok 2019: Toyota Camry TRD Sportivo w bodykit"